Objective of the splint: Positioning of the thumb in functional position. In cases of sprain with associated edema, the orthosis needs to be remolded when the edema decreases. It is always beneficial to have several pattern designs to choose from and match the most appropriate orthotic design to the needs of the individual patient. A previous ‘Splint in the spotlight’-post featured the Long Opponens / Thumb Spica Orthosis. 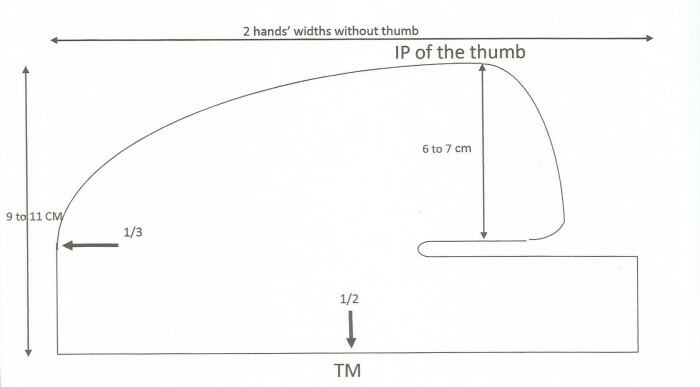 The distance between the MCP flexion crease of the second finger and the IP flexion of the thumb should be between 6 and 7 cm (2.5” – 3”). 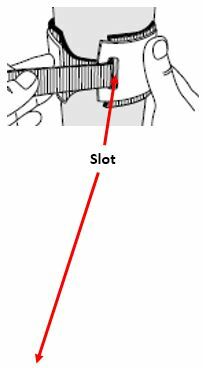 To secure the splint on the ulnar side of the hand, it’s beneficial to use a pulley system for the Velcro as shown in this drawing: the circle which surrounds the hand prevents the thumb from ante and retro-pulsion. The Short Thumb Spica Splint should be fabricated from a coated (non-stick) product between 1.6 and 2.6 mm (1.6”- 1/12”) thickness: Orfit NS, Aquafit NS, Orfit Colors NS, Orfilight Black NS or the new Orfilight Atomic Blue NS (to be launched soon!) are the excellent materials for this design because they are elastic products. As shown in the photo, the material overlaps around the thumb and can be easily opened or shut. This allows the wearer to loosen or tighten the orthosis based on comfort and adjust if the thumb is swollen. Thumb Sprain: day and night during the healing phase, typically 6 weeks duration depending on the severity of the sprain. Basal Joint Arthritis: for functional activities during the day. If the patient has significant thumb pain, then using a Long Thumb Spica in the resting position at night might be helpful. Median Nerve Paralysis: for functional activities during the day and for positioning at night.